Lorraine Higgins was also told she should have been aborted. SENATOR LORRAINE HIGGINS has published plans to make cyberbullying and sending online threats a criminal offence. The bill would make it an offence to share any message that incites someone to self-harm or take their own life. Higgins said this issue would be decided on a case by case basis in court. If found guilty, a person would face up 12 months in jail, or a fine of €5,000. Higgins, who is a barrister, has been the subject of online abuse including two death threats (one involving a hatchet) – of which she has made gardaí aware. Some of her family members have also been threatened, including a “deeply disturbing reference” to her mother. In November, she deleted her public Facebook page after being told she “should have been aborted”. Higgins said legislation like this is “necessary in order to keep our online social media platforms a safe and decent place for everyone to discuss ideas, debate and whatnot”. She said it’s “unfortunate that politics has descended into this” but she is “thick-skinned”. After going public with her experience, Higgins said young people came to her to tell her examples of cyberbullying of their own. Higgins said she is “absolutely intent on bringing forward a piece of legislation that will protect people, not just politicians but to protect vulnerable people and children”. The Labour Senator was sharply critical of social media outlets, accusing them of “shirking their responsibility”. She said Facebook never responded to a complaint she made to them. They’ve no difficulty in communicating with Oireachtas members or agencies of this state when they’re seeking to avail of our corporation tax rate but yet when it comes to responsibiltiy or their users they totally shirk that. She said Communications Minister Alex White is “broadly supportive” of the bill, and she welcomes debate on the issue and amendments proposed by both government and the opposition. Higgins added that the issue was “apolitical” and “shouldn’t be used as a political football”. Also speaking at the launch, fellow Labour Senator John Whelan said social media “should not be held to lesser standards that the traditional media”. He described the bill as a “work in progress” and “the start of a process for holding people to account”. Labour has been quite busy on this issue of late, with former Communications Minister Pat Rabbitte introducing a separate bill that will make it an offence for “a person to send, or cause to be sent, by means of a public electronic communications network a message or other matter that is grossly offensive or menacing in character”. At present Irish laws only ban sending abusive messages over the telephone. 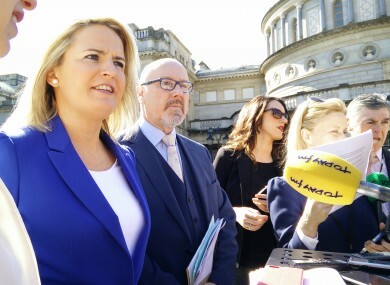 Rabbitte said the bill “will close a loophole” in legislation, support victims of abuse and “strengthen the capacity of the Garda Síochana to deal with reports of offences”. Email “Senator cracks down on cyberbullying after being told she'd be 'hatcheted in the face' ”. Feedback on “Senator cracks down on cyberbullying after being told she'd be 'hatcheted in the face' ”.